If you are located in Yukon, OK and are searching for Couples Therapy and Marriage Counseling services please contact one of our offices today. We are here to help your relationship. If you are in Yukon, OK and think you could benefit from the help of marriage counseling, contact Marriage Solutions. Whether you are married or not, Marriage Solutions offers couples therapy in the Yukon, OK area that can help you both take back the reins of your relationship. Being in a relationship is almost always wonderful at first. It is a time of high emotions and passions, and shared dreams for the future. It is normal for this initial burst of energy to become more subdued over time, but many couples feel as though they lose that energy entirely. One of the issues is that people change over time. In a relationship, it is important that you grow together as you change. Each partner must support and value the other. Communication is a big part of this. Each partner needs to be able to communicate his or her needs. Not only this, but the strongest relationships are those in which both partners feel loved and valued. This means that it is not enough to love or be loved, but that these feelings need to be clear. Again, a lack of communication can be the issue here. Left unchecked, poor communication can cause misunderstandings and assumptions that can become more serious over time and can do serious damage to a relationship. Our marriage counseling in Yukon, OK, has helped many couples take control of their relationships. We have the training and practical experience to help any couple take an objective look at their situation, see that it is not all lost, and work towards a future in which both partners can feel happy, valued, secure, and optimistic. It is often the case that one partner wants to go to therapy more than the other. This is common. It does not take long before both partners see the value in the sessions and their investment in the process becomes more balanced. Sometimes, one partner is not at all receptive to the idea of coming to marriage counseling. If your partner refuses counseling, we can still provide help for you. This poses challenges to the process, but we can help you, including teaching you to communicate in a way that your partner is more likely to respond to. Even if your partner does not change his or her mind about joining you in counseling, coaching can help you take the next steps. At Marriage Solutions, you will find that we are non-judgmental. We have seen all sorts of couples in all kinds of situations. Some problems are worse than others. It is not our business to judge our clients, though. Our job is to help you regain stability and happiness in your relationship. We start by listening to what you have to say. Our goal is to help you overcome your issues, and the best way to get to the bottom of those is to listen to your thoughts, feelings, fears, and desires. Then to teach you how to really hear and understand what your partner wants and needs as well. 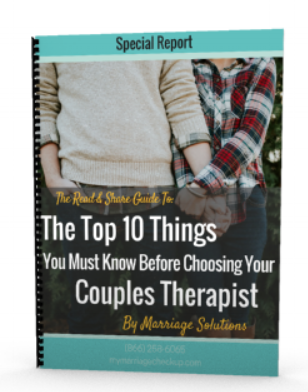 Many people who come to couples therapy tell us that it helped to have someone non-judgmental and unbiased listen to them and consider all perspectives. Long-lasting improvement takes time and effort, but improving both of your communication skills and learning how to break out of your negative cycle will reduce tension immediately. Marriage counseling offers people in Yukon, OK this and much more. To find out more about how we can help you, set an appointment with one of our friendly counselors at Marriage Solutions today. With locations in Tulsa and OKC we also serve the Edmond, Moore, Norman, North OKC and South OKC areas.